Super Chic No-Cook Dessert: Coconut-Mango Macaroon Cakelettes! / Hey, EEP! 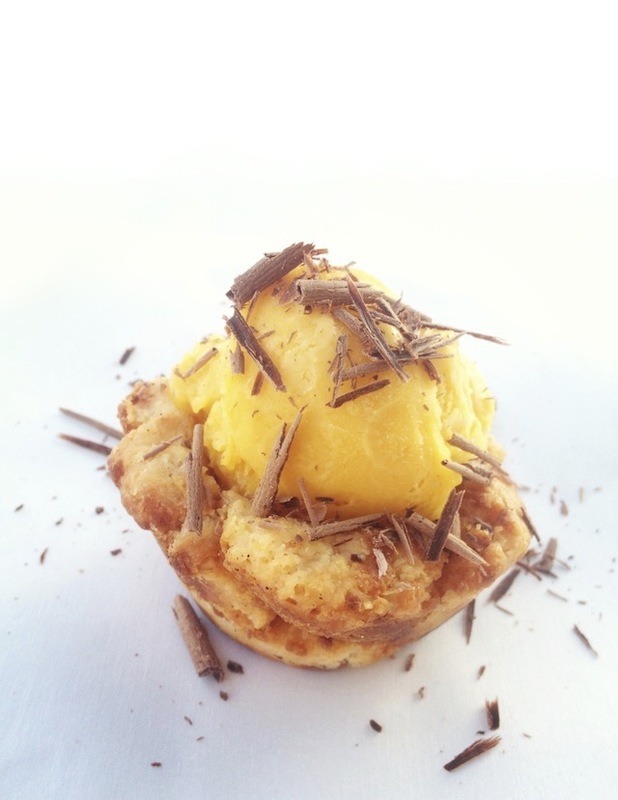 Super Chic No-Cook Dessert: Coconut-Mango Macaroon Cakelettes! Oh hey! We've been cooking our buns off in the test kitchen, so my after-work baking sessions have waned. It's sad—sniff!—but don't fret! I've been dreaming up easy no-cook desserts as a result, like this coconut macaroon ice cream cakelette. There's something so delicious and sneaky about a chic treat you can (quickly) whip up at home in time for a family meal or impromptu dinner party. It's what gives savvy hostesses that je ne said quoi! 1. For each cake, press about 8 coconut macaroons into the bottom and up the sides of an ungreased muffin tin cup, pressing and smoothing the macaroons together to form a solid base. Use a pairing knife to gently release the shell (or flip the cupcake pan upside down and tap to release). Repeat to make 4 shells. 2. Fill each shell with 1 scoop mango sorbet and garnish with shaved dark chocolate. Lovely! This looks like such a great combination of flavors/textures. Wonderful! Hey Sara! Thanks for the feedback—I love this flavor combination. I was actually just thinking that it might be fun to brush the inside of the macaroon shells in melted dark chocolate (chill a few minutes to set) before adding the sorbet for ANOTHER layer of chocolate :) but that's just my chocolate-loving brain going wild...Thanks, again, Sara! Hello out there! Just a heads up that when I view your blog on internet explorer (work computer - i know, who uses internet explorer?) the text displays really crazy, like in a looong line down the page. It looks ok in chrome so it must be an ie issue - may want to try and troubleshoot! ps must see you soon!